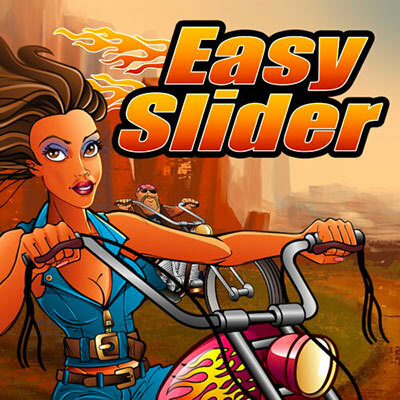 Get your adrenaline pumping as you ride your way to riches in this Easy Slider slot by NextGen. It’s a 5-reel 25 line slot with an array of bonuses including free spins, scatters and unique bonuses like NextGen’s Slide a Wild and Biker Chick Wilds. The game’s aesthetic includes a flaming ghost rider looking skull and crossbones as the backdrop, a cool bike, and an upbeat soundtrack, which will have you feeling like you’ve been transported to the beginning of a thrilling adventure.The game includes 9 staking options that range from 0.01 to 2 coins with a maximum of a 50 coins bet per spin. NextGen uses a B2B approach to business where most of its games end up licensed under bigger brands, unlike most of its competitors like Microgaming and Playtech.NextGen games are available on software platforms like Amaya, Bally, Aristocrat, etc. Although NextGen games are popular and received well on these platforms, they tend to be looked at as background slots for because of theirlow quality in graphics and audio components as well. Although they have this disadvantage, the slots are still successful and popular because of the developer’s ability to create a balanced between game features like free spins, bonus games, scatter payouts, etc. and extra specialfeatures that create that NextGen mark. Innovations like the Slide-a-Wild feature, or the Select-a-Play function are only available on NextGen slots. The lowest paying symbols are the cards A, K, Q, J, 10 and 9 that pay between 5x to 100x depending on how many you collect. Themed symbols pay higher values if you land 5 of them like crossbones, sunglasses and skulls all reward stake multipliers of 150x, discarded helmets win you 250x and easy sliders get you 500x. Wild symbol- The Biker Chick is the wild and she pays up to 500x your stake if you manage to land 5. The wild also substitutes for all the other symbols except the scatter. Scatter symbol- The scatter is a burning rubber wheel.If you find5 scatters, your stake is multiplied by a 100x multiplier. 3 scatters can also activate up to 15 free spins where allwins are doubled. Slide A Wild- This feature allows players to slide a wild on any of the reels if they need it toform a win. Each reel pays a different amount with the 1st reeldoubling your stake and the 5th one multiplying it 6x. Don’t hold off on the slide a wild feature waiting on the value on a particular reel to grow. Instead, always slide it to whatever reel will give you the highest outcome. The game has got the right visuals and audio to accompany the theme. The animation also flows smoothly. The slide a wild feature is a nice uniqueaddition for those extra wins.